A few years back, I hypothesized that there would be a correlation between the number of EEOC charges and the unemployment rate. I made a pretty chart and there was a pretty strong correlation (.895). A reader asked for an updated chart, and who am I to deny the people what they want? For the unemployment rate, I used the rate as of January for the following year (e.g. as of January 2017 the rate was 4.8 so I used that as the rate for 2016). One could argue for something more nuanced (perhaps an average rate across the year?). Also, for EEOC charge statistics . . . we should presumably see some increase over time based solely on an increase in the population. Perhaps charting charges as a percentage of population? 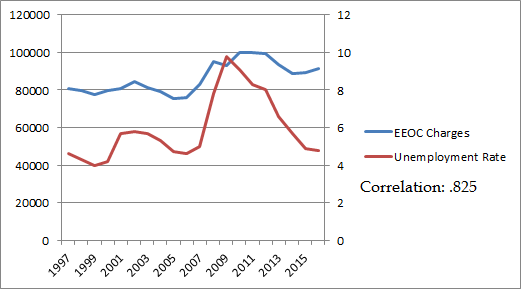 In any event, the correlation was not quite as strong after factoring in the past few years, but still clearly exists. One day I may dig a little deeper into the data.